The Episcopal Diocese of Maine elected the first openly gay bishop to lead its church at a convention in Bangor on Saturday. After three rounds of voting, Rev. Thomas James Brown, 48, received the majority of votes from 261 clergy members and laypeople, according to election results. His election must be confirmed by other Episcopal dioceses across the country before he can be consecrated in June. If confirmed, Brown will be the 10th bishop elected to lead the church. The church’s current leader, Bishop Stephen Lane, is retiring. The Episcopal Diocese of Maine received a record number of applications last year for the position. The church received 27 applications and was narrowed down to five finalists who visited the Maine episcopal congregations earlier this year. Maine’s Episcopal diocese was formed 200 years ago. Across the state there are currently 59 Episcopal congregations and 18 summer chapels. 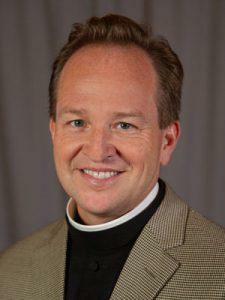 Brown, a native of Michigan, has served as the rector at the Parish of the Epiphany in Winchester, Massachusetts, for the last 10 years. Brown was ordained in 1998, after receiving a Master of Divinity from the Church Divinity School of the Pacific in Berkley, California.